Finally heard from Michigan last week. Is reportedly a big U-M fan and really wants a Michigan offer. 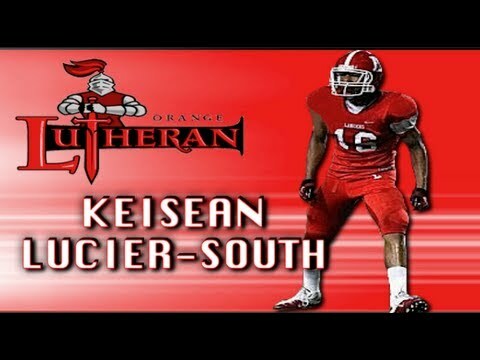 My friend's (ex-neighbor) son plays for Orange Lutheran. I think I'm gonna go check out a game. His mom is just as excited as he is, and he reiterated that Michigan is his "dream school"..........so I'm assuming U-M is playing from behind here. LOL now that is hilarious! CA/Lutheran) made his first contact with the Michigan coaching staff, a school he's hoped to hear from for a while. "When we first talked, he (Coach Ferrigno) said how he really liked my tape a lot and talked to our coach about what kind of scheme we run at Lutheran," he said. "My coach told him a lot about my pass-rushing abilities. We talked a lot about Michigan and how great of a school it was. He said he's looking to come to one of my games this year, maybe in September to check me out as well." There was also a lot of conversation about why Lucier-South likes Michigan so much. In an interview a couple months ago with 247Sports National Analyst Justin Hopkins, he described Michigan as a "dream school". He reiterated that sentiment again. "My coach told him about how I liked Michigan. When I first called Coach, I was really nervous because I didn't want to mess up," Lucier-South said, laughing. "When I was talking to him, I kept telling myself that I couldn't believe that I was talking to someone from Michigan. They are really my dream offer. If I got an offer, I wouldn't commit right away, but if I really get that Michigan offer, it would be a dream come true. Me and my family are big Michigan fans. I grew up watching them every Saturday and it'd be a really great thing if I got that offer." There wasn't much hesitation in saying who would be at the top of his list if an offer did come. "Honestly, yeah Michigan (would be at the top); they really are my dream school," he said. "I still have a lot of other schools that are interested in me and I have some places I want to go see as well." With offers from Texas, Miami, UCLA, Washington and Tennessee among others, there's no reason to rush, and a concerted effort to learn more about the academic side of things is the biggest priority right now. That was another point of discussion with Ferrigno. "We talked a lot about academics," Lucier-South said. "I made it clear that academics is the top priority for my family and I. I know Michigan is a great school as well and I'm already doing my background work in terms of what type of programs I'd be interested in in college." Multiple Crystal Ball picks already in for Michigan, including from 247's West Coast guy, Justin Hopkins. Ha ha! Let's not forget academics are his top priority. Now we're REALLY playing from behind. "I'm going to wait until (2015's) Signing Day. I don't want to commit early if there are other schools I am still interested in, so I just want to wait until then to see who I like." "UCLA is probably I would say the team to beat right now. I have been talking to them the most right now and I've seen them and been to their school the most so they're the team to beat." With Mora there ucla is going to be a major force to be reckoned with. Taking his official visit to Michigan for the Penn State game on October 11. You should be visiting him weekly, giving him a taste of that home theater money you're always talking about. 1:27pm and his battery's already at 57%? Announcing Top 5 on August 8. "I love the program, It's my favorite school. The tradition there is insane. I've been watching them since I was a little kid. I can feel the vibe over there and that's why I chose them as my first official visit, too. I want to check it out. I really love Michigan right now." Earned his 5th star on Rivals today as a LB. "From that visit, I was really surprised with Oklahoma and I really like them," Lucier-South said. "I just love how they work the team. I love the program. The players said the coaches are all for the players and they care about the players first and it's just like a big family. "The whole town cares about the football team. I really like that. Oklahoma is doing great right now. I'm not going to say who my leader is but they're improving and they're doing a great job." We have Mark Smith though!! "I want to see what's going to happen because that staff offered me, so if a new staff comes in I don't what's going to happen," said Lucier-South. "This weekend I want to see if the campus is going to fit me or not. I want to see how the academics are. I already know about the program. Academics are important because for the other nine months after you are by yourself, so I want to see if there's a fit for me." Visiting this weekend for the P$U game.